How to make a special dessert treat that's quick and easy - banana ice cream which the kids will adore! The ice cream base is the essential part of what makes ice cream really creamy and luxurious. The basic principle for making an ice cream base is to use cream and/or milk, egg yolks and sugar. Some people create a mix from these ingredients without heating when it’s generally referred to as a cream base. 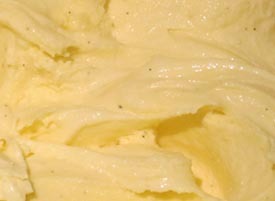 Others, myself included, prefer wherever possible to use heat in the process and create what’s known as a custard base. First of all beat and mix together the egg yolks and sugar until thick. Separately, pour the milk into a saucepan and scald it (bring slowly up to boiling point). Pour the hot milk into the egg yolks and sugar mix whilst continuously stirring. 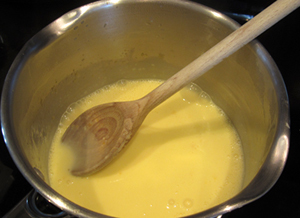 Then pour the mixture back into the pan and heat gently, stirring until the custard thickens - DO NOT BRING TO THE BOIL OR IT WILL PROBABLY CURDLE. When you can see a film form over the back of your spoon it's time to remove the saucepan from the heat. Leave to cool. c) chill the cooled custard thoroughly in the refrigerator. Whip some double cream and fold it into the chilled custard. Then add your chosen flavoring and transfer mixture to an ice cream maker. If you're counting the calories and want to use less butterfat or if you simply don't like your ice cream too creamy, you can use semi-skimmed milk instead of full cream milk and light (single) cream instead of heavy (double) cream. You can go further still by leaving out egg yolks, cream and sugar and use milk or light cream combined with sweetened condensed milk. 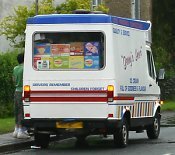 I have some easy ice cream recipes based on these ideas which I hope will be useful.